We love Tom Kerridge’s food but find his recipes can require a lot of work. Not so with these sticky drumsticks but you will need to find some malt extract to go in the marinade. We got ours in a good deli but health food shops should also stock it. We’re confident you’ll like the drumsticks enough to make them again and use it up. Beer Suggestion: to complement the malt extract it makes sense to try a malty beer and we suggest searching out one of the many craft beers in your area. Our pick this time was the Five Lamps Dublin Lager which is a pilsner style but with a malty kick. Pour the honey for the marinade into a small stainless steal pan and warm on a medium-high heat. Continue to cook until it starts to turn a deep shade of amber (easier to spot if you have a pot with a light coloured interior), then pour in the soy sauce and chicken stock to stop it cooking further. Bring the mixture to the boil and whisk in the malt extract. Take off the heat and allow to cool. Put the drumsticks in a bowl and pour over the marinade. Mix in the garlic and ginger, cover the bowl with cling film and leave to marinate in the fridge for 2 hours at least or overnight if you can. 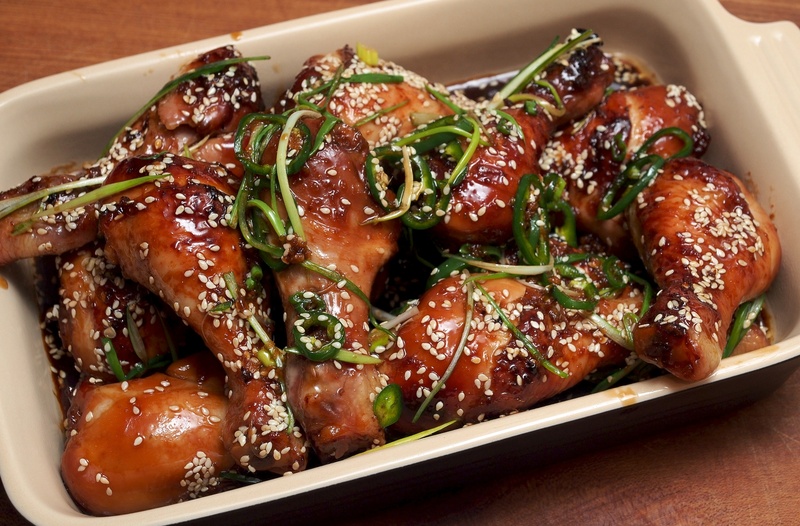 Put the drumsticks in a roasting tin with their marinade. Cook for 45-50 minutes, basting a few times, until the chicken is cooked through and the meat comes off the bone easily. The drumsticks should be glossy and sticky. Remove the tray from the oven and immediately drizzle with the sesame oil and toss in the sesame seeds. Throw in the scallions and the chilli. Roll the drumsticks around in the dish to make sure they are evenly coated.